One of the more positive aspects of social media is the proliferation of images that allow us to see our experiences through another lens. Although I still have hundreds of my own photos to sort through, I wanted to post some of the photos that turned up on Facebook while I was away — for my own archives more than anything. This post is also an excuse to tell a few trail stories. I've already decided that I don't want to hammer out a 20-part post that's doomed to fade into the over-stuffed jumble that is this blog. I'd rather spend some time crafting a focused narrative, and if it seems good for a book, great. The above photo is a favorite, taken by Mike as he and I traversed the sea ice of the Norton Sound amid a stout windstorm. When we left Shaktoolik, the village weather station was recording a north wind of 28 mph with gusts to 43 mph, and temperatures forecast from -10 to 0F. 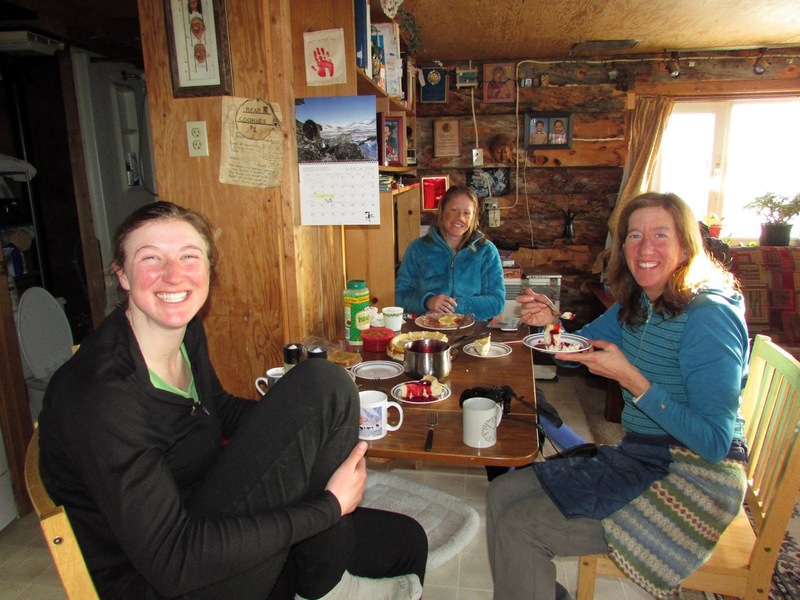 It took us two days to make the 48-mile crossing: A moving time of 21 hours and a purposefully long rest in a shelter cabin to shore up strength and wait for the wind to die down overnight (it didn't.) The "trail" was little more than waves of hard and soft sastrugi — difficult to discern until the front wheel either floats or sinks. The windchill was breathtaking. Facing directly into the wind without a face mask, I genuinely could not breathe. Stopping to either eat, drink, or pee invited a chill that cut to the core and remained far too long, which added to my simmering anxiety. I eventually gave up drinking in order to eliminate the worst chore — peeing — but the effort was so strenuous that I did try to stay ahead of an absolute bonk. At one point I set my bike down, and the entire contents of my gas tank bag — including two candy bars and a ziplock bag half-filled with trail mix — blew away. 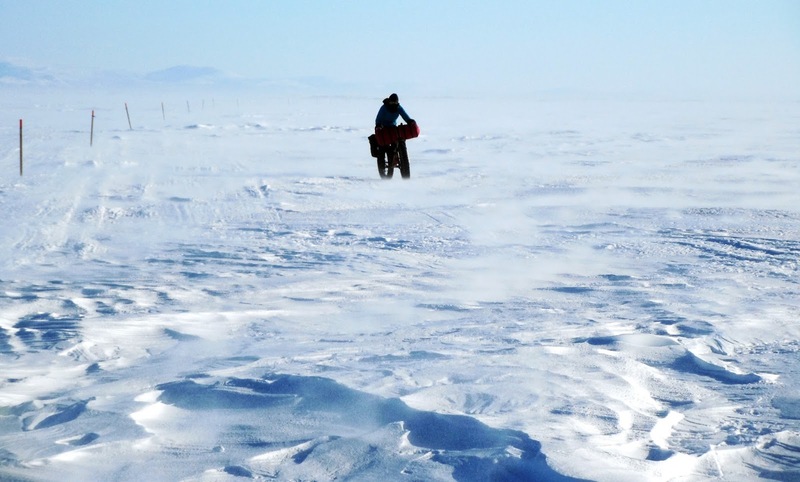 The sea ice was an intense experience — at once urgent and tedious, adrenaline-charged and exhausted. 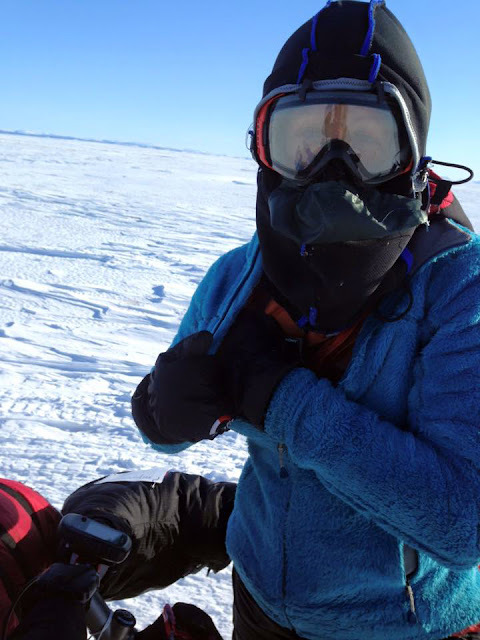 I'm still processing the wisdom of the sea ice and excited to write more about the whole experience. Until then, photos! 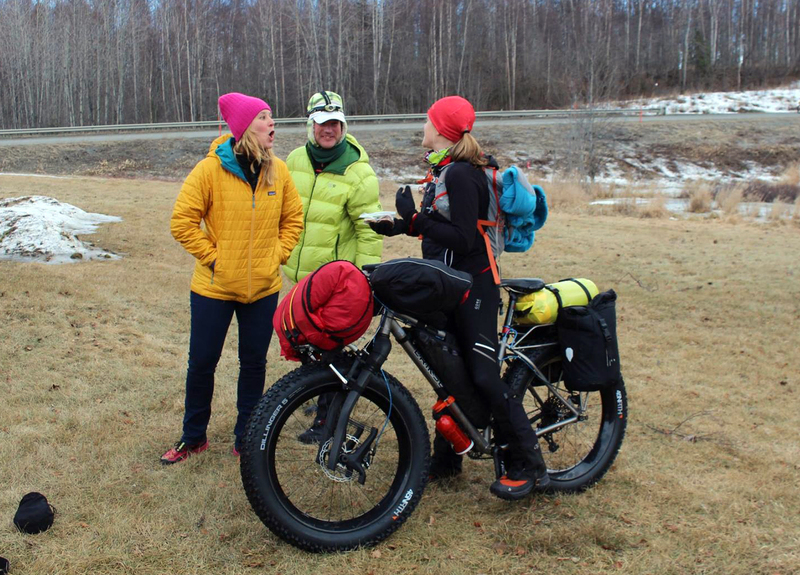 Chatting with Dave Johnston and his wife, Andrea, just before the start of the race at Knik Lake. I still can't believe how brown it was! 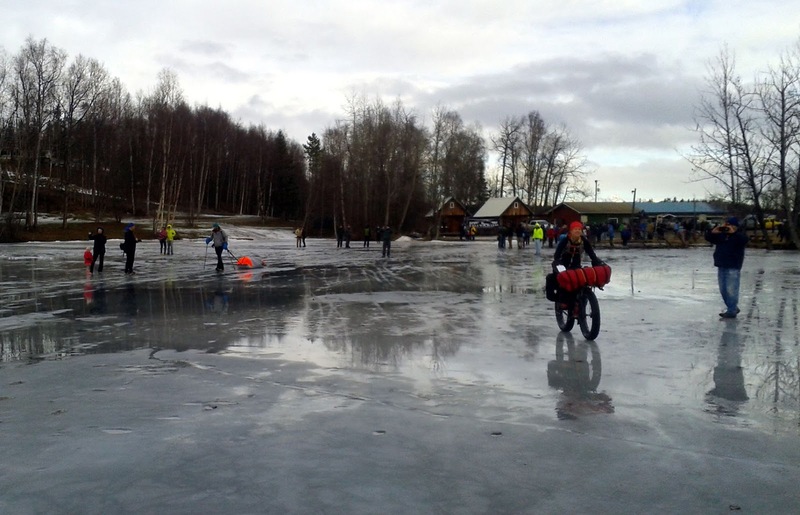 Sixty-five runners, bikers, and a skier lined up on the shoreline of Knik Lake. Sixteen were on the roster for Nome and ultimately 14 would finish. Back in what some might refer to as the good ol' days of the ITI, the finishing rate was usually less than 50 percent for the 350-mile race, and five or fewer reached Nome. Since 2013, this race has seen finisher rates higher than 90 percent. I believe the reasons for the success rates have been consistently "good" trail conditions and weather, a more rigorous racer screening process, and access to more information online. Even back in 2008, with just a few race reports and not much else, there were more unknowns. In 2016, we have GPS tracks, a plethora of race reports, at lease two books (my fault), folks posting photos of current trail conditions on Facebook, Trackleaders real-time race updates, Web cams, weather stations ... Bah! Kids these days. I started the race resigned to this conviction that I was going to be among the 10 percent who dropped out. My feelings on this issue are complex, but after the failures of 2015, I harbor a fair amount of resentment for the "death before DNF" attitude. I'm all but convinced that my decision to continue with the Tour Divide while I was sick with bronchitis directly contributed to the asthma symptoms I've coped with ever since. Mentally, I gave up on the Nome dream back in January, and I was resolved to put my health first even if it meant a $900 pilot pickup at some remote checkpoint. Sure, I really wanted to go to Nome, but yeah, I felt it probably wasn't my year. I love this photo because my and Beat's faces reveal much of what we were feeling as we rolled off the starting line. Beat has that silly grin because he's as happy as a puppy at a playground, and my face says, "Thanks for cheering ... but this is going to be a disaster." 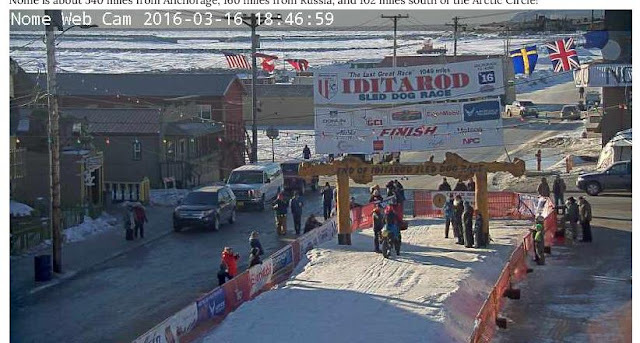 Also, I can't be too critical about the Iditarod Trail's bygone days of mystery, because I'm as attached to information and technology as anyone. My GPS was acting up at the start line, and I nearly panicked. Beat helped me restart it, and that was the last exchange we shared before we went our separate ways for 24 days. 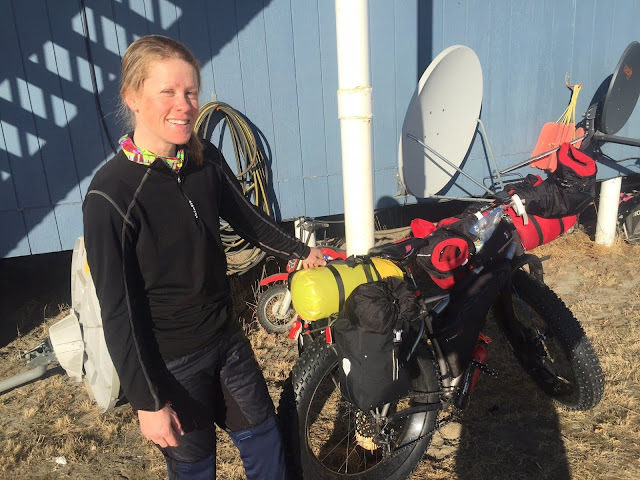 I was a bundle of stress on the first day, full of all these tight emotions that I now regret — not the least of which was the fact I arrived at Skwentna on the first night with a numb right hand that was no doubt aggravated by stress-throttling of the handlebars. I also regret being so wound up because the first day of the ITI is generally a fun day. If trail conditions are good, the going is pretty easy, and it's the most social day because racers are still packed together and there are spectators around. Indeed, even with my resolve to take it as easy as possible and not aggravate my lungs, I still averaged 9.7 mph for the first 88 miles — which is flying on a loaded fat bike. Tony posted the above photo on Facebook alongside one he took at mile seven of the race in 2008, for a fun retrospective. A first-day photo along Ayrshire Road. This spot brought back fond memories of running the 2012 Susitna 100 with my friend Danni. 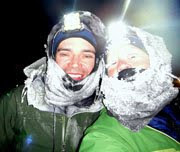 This is a photo of Mike and me shortly after we crossed Flathorn Lake. 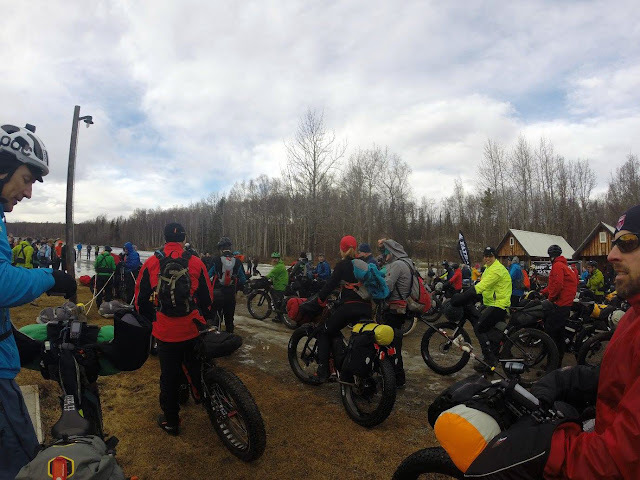 We ended up riding together and chatting for a while on the Yentna River. As I mentioned earlier, I was a bundle of stress, and Mike is a laid-back guy even in the most daunting situations. His happy-go-lucky attitude helped me dial back the anxiety, and I enjoyed his company. Little did I know we'd end up becoming Nome buddies. This photo was taken the following afternoon, near mile 145, as three of us ascended the steep climb after the Happy River Steps. The first 30 feet of the climb is a near-vertical river bank, and I was sure I was going to have to remove my bike bags and portage the load up the bank in trips. 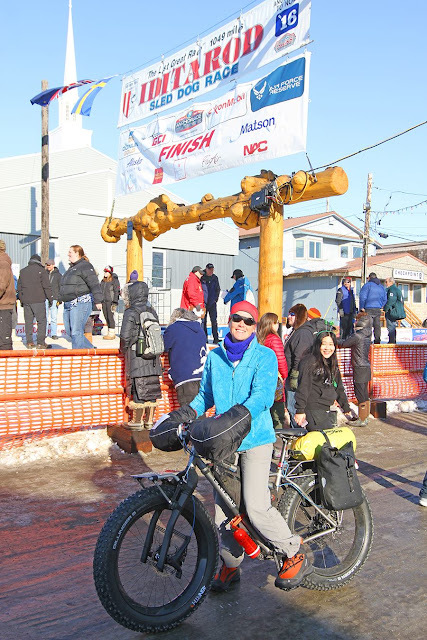 For those who are curious, I discovered at a cargo carrier in Nome that the weight of my loaded bike was 68 pounds, not including food and water. 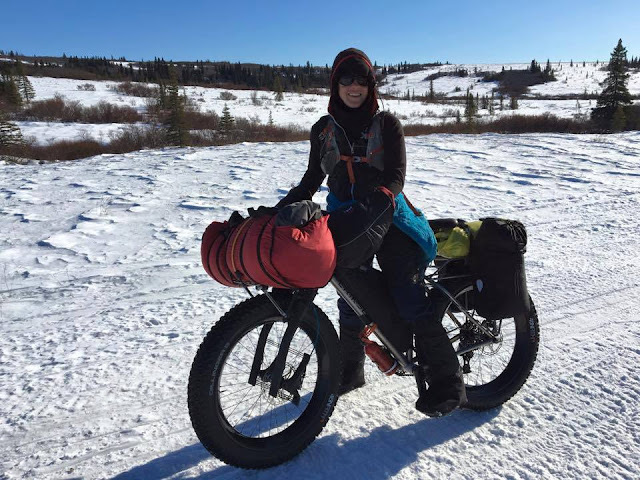 I'm actually quite happy with my gear choices — I had a comfortable safety margin, and would not choose to leave it behind — but there were a handful of situations where I wasn't quite strong enough to manage the weight. Happily, I arrived at the step just as Leah Gruhn and Lars Danner were dragging their bikes up the headwall, and they helped me with mine. "You just saved me at least a half hour!" I exclaimed to my fellow racers. In truth, they may have contributed to saving my race. On day two I was still wound-up enough to attempt high-intensity efforts, even though I could sense these efforts were causing me respiratory distress. But I had no desire to portage gear and may have attempted to drag the bike myself, which may have resulted in an asthma attack. As it was, I desperately needed to use my inhaler at the top of this climb. Thanks Leah and Lars! I arrived in McGrath around 10 a.m. on Thursday morning. I forgot to note the arrival time, and I'm disappointed about this as it would be interesting to know my McGrath "split," but it's somewhere in the range of three days and 20 hours. 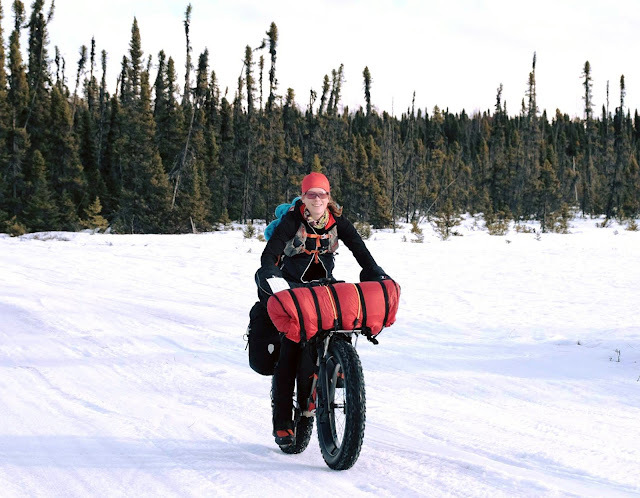 I pedaled most of the 50 miles from Nikolai to McGrath in the dark, shining my headlamp on a startling number of huge wolf tracks and thinking about how daunting it would be to leave McGrath, but damn it, I probably have to do it. The Northern Lights were out. The temperature was -10. I had to let my frost-lashes thaw for a while before I could remove my balaclava. 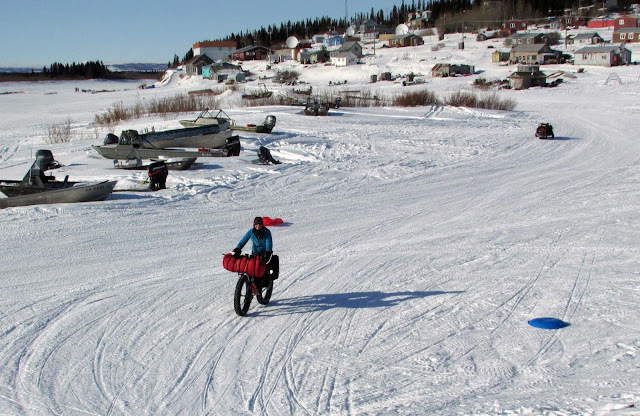 This photo is about 250 miles later, in the Yukon River village of Galena. Larry Hausmann is a local who went out of his way to collect drop boxes and set up accommodations for every ITI racer who rolled through town. Super nice guy! I arrived in the afternoon and stayed only an hour to make lunch. I love that I look sunburned and sweaty in this photo. 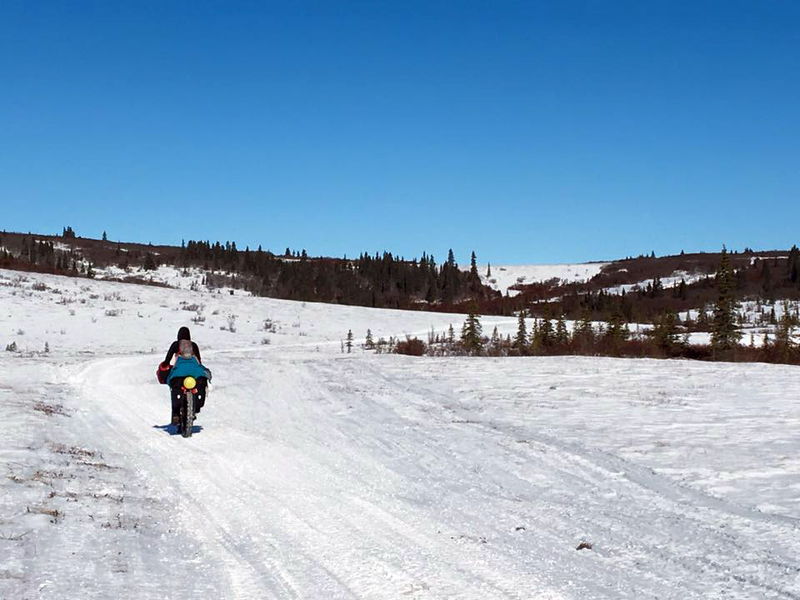 I saw subzero mornings on the Yukon, but some of those afternoons were downright hot. After I left Ruby, I didn't see Mike at all for more than 200 miles until he caught me on the Kaltag Portage, which was a magical day of hard-packed trails, fast descents, big crashes, and beautiful scenery. A man from Unalakleet and his friend from Minnesota caught up to me on their snowmobiles about halfway through the Blueberry Hills, 15 miles out of Unalakleet. It's always fun to meet fans, Spot-stalkers even out here in remote Western Alaska. Heading off toward the hills on a windy but warm late morning. I think it was 20 degrees. 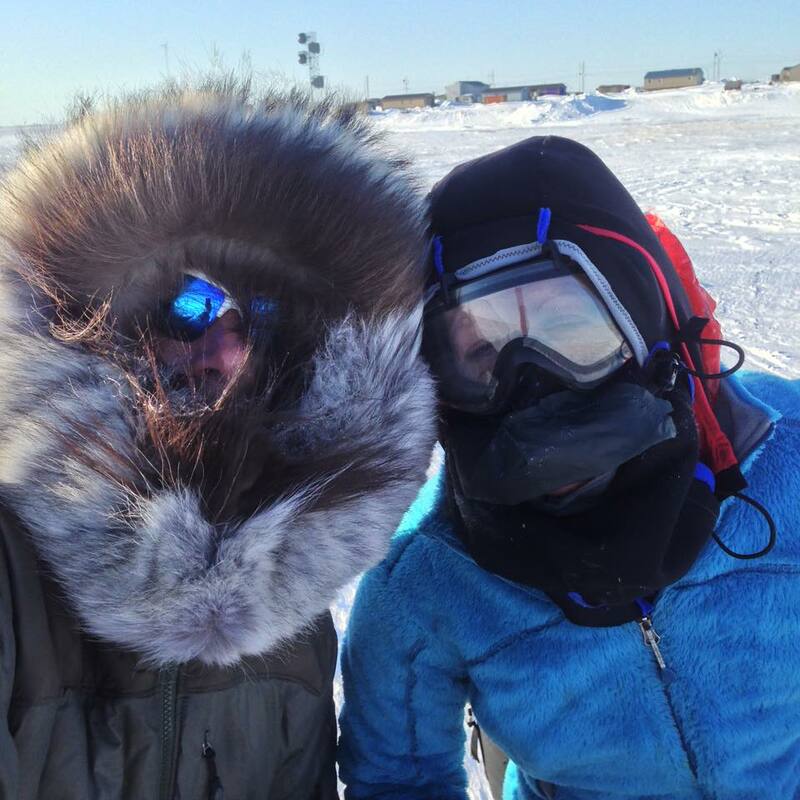 Leaving Shaktoolik, Mike and I geared up for Antarctica. At first I was jealous of his wolf ruff, but in the headwind he had to cinch it up so much that he could hardly see. At one point I mentioned the shelter cabin, which is painted bright orange and which I had been able to see for at least two miles (it was still two miles away), and he said, "What? Where?" He called his ruff "A Chewbacca tunnel." I liked my big clear UV-protective goggles and wind-shield fleece balaclava with silnylon nose and mouth pieces (designed and sewed by Beat) It was effectively windproof, although I did get a patch of frostnip on my cheek where the tape I put over my nose and cheeks ended, because I was often ripping the mask down to catch my breath. This might be the moment that I thought I was putting my camera back in my hydration vest pocket, but instead just stuffed it in the coat, where it eventually fell out. About three miles from Little Mountain shelter cabin, I realized my camera pocket was empty. Oh, sorrow. I told Mike I had to go back to look for it and vowed to only backtrack two miles — one hours' worth of travel into the wind, probably only 15 minutes with the wind — before giving up. He and I both knew that the last time we used our cameras was at least six miles back. I'd already resigned myself to the idea that my camera and every photo I'd taken thus far were gone forever, but it sure felt amazing to ride with the wind. Even though the trail was still crap and I could barely top 7 mph while the wind roared at 30 mph, it still felt amazing. And happily, my camera had fallen out only a half mile back. Oh, joy! I was very overprotective of it from that point on. 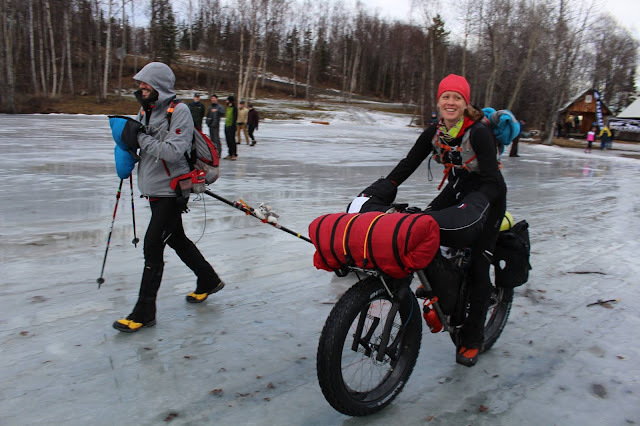 Joanna is the Iditarod Trail Invitational's most wonderful trail angel. She lives in a house on the river in the village of White Mountain, and takes in every single human-powered traveler than traipses through town, regardless of state of hygiene or hour of the night. She took this photo as she waved me toward her house. These two women, Robin and Laura, were skijoring the Iditarod Trail from Unalakleet to Nome with four dogs (Robin, who lives in Koyuk, joined in Koyuk.) Joanna invited them over to dinner and fed us spaghetti with caribou meat sauce, French-press coffee, and homemade cheesecake with blueberry sauce. At this point I'd put all of my clothing in the washer and taken a long, incredibly relaxing epsom salt bath that Joanna drew for me. A bath! Beat still teases me that I took a bath in White Mountain and still came in under the record. It does say a lot about the fast trail conditions we enjoyed this year. After I came down with lung congestion in Koyuk, I was far away from any kind of racing or hurriedness for the rest of the journey ... until Jason Mackey passed me at Topkok. 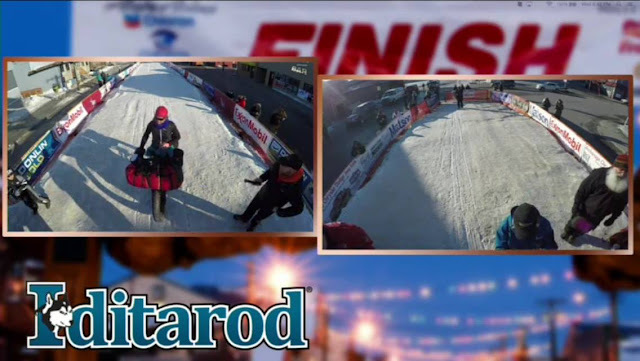 Captures from the Iditarod Sled Dog Race's Nome Webcam. If you look at the photo on the right, there's a man with a big white beard. That's Hunter from Ketchikan. I know him from my Juneau days, when he was a regular blog reader and commenter (he admitted to me he lost interest after I left Alaska.) Small world. He and his wife were in Nome to watch the mushers, and treated me to sushi dinner at the Bering Sea Restaurant. Sushi in rural Alaska ... it actually was pretty good. 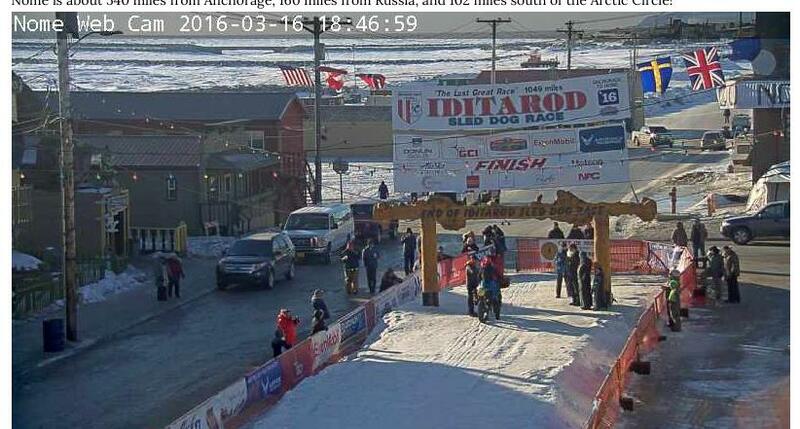 Another capture from the Nome Webcam, shortly after I rolled up to the burled arch. 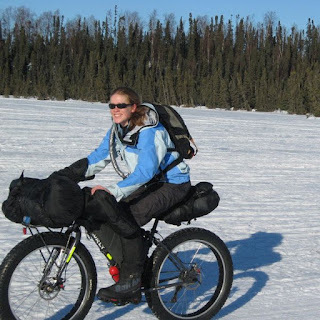 "When I first came to the Iditarod Trail I experienced something in my long line of adventures that was very different. Just before I finished in McGrath, I felt an almost overwhelming sense of sadness. It was over! 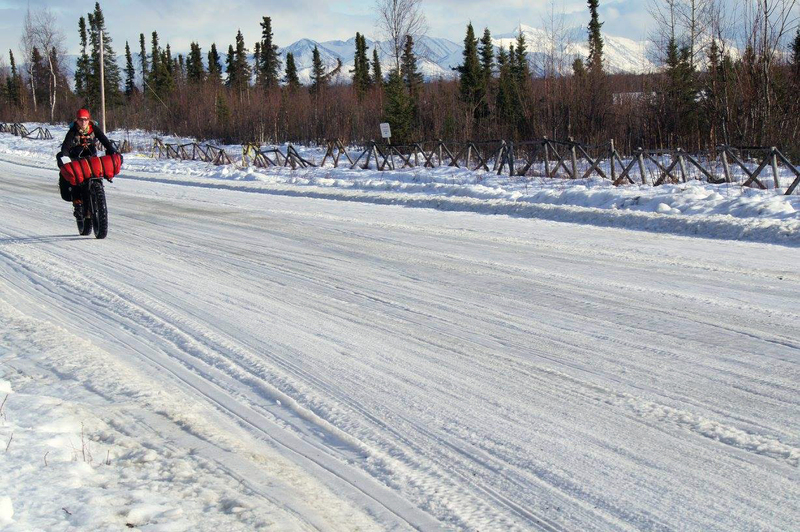 Every year, when the Iditarod Trail comes together, a culture older than recorded time becomes available to visitors from another place. We get to experience a culture born when everyone was a traveler in the North Country and hospitality on your journey could mean the difference in life and death. The lodges, checkpoints, cabins, community centers, schools and private homes become the hunting camps and villages or the roadhouses of more modern times along the Iditarod Trail. Just like times past it takes them and those with the skills and mindset to put in a "safe" route for all of us with the wanderlust no matter what our mode of transportation to follow. A 1,000-mile community is born for a few weeks each year for us to be part of. It is all of this combined with being around the amazing group of people this race attracts that made me need to come back every year for the last 19 whether as a racer (a time long past) or trail support." Why do we keep coming back? That's why. Fantastic post on a fantastic adventure! It's great that there are so many fans out there sharing pictures! Not only do you have YOUR plethora of first person view shots, but you also have their views of YOU and all the other racers. Look forward to your story in whatever form it takes...I'd think the story will end up being huge (and and book-worthy)...but just my 2 cents worth. So now you pack up and head to Boulder? No rest for the weary! Just glad you both are back safe and sound. Oh, and I meant to comment the other day on your pic of Tim's feet...OMG! I like Beat's strategy of taking CARE of himself much better!!! You've gotta take care of yourself...we only get 1 go-round on this crazy race of life. We need to enjoy it, but we also have to be able to fight another day too. No race is worth permanent physical damage. Also to note the conditions can vary wildly. Last year we had -50F, and 3 days later +40F. 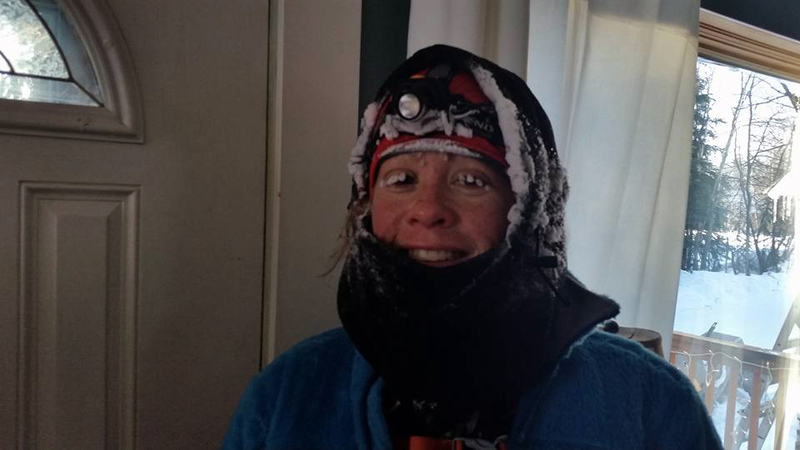 In 2013 we had -30F temps with ~20mph winds which makes for a -60F windchill right there. But again, just a few days earlier it had been raining! Enjoyed this account and the photos. Gives a good feel for the journey. So interesting that you were pretty much resolved not to make it to Nome, but then you did. I think that says something about letting go and just going with the flow. Resolved not to make it to Nome isn't the right characterization, but I did go into this with low confidence in my fitness/health, along with renewed perspective that the mindset we call mental toughness can sometimes lead us down negative and even dangerous roads, and I don't want to travel down those roads (if they can be at all avoided.) The ITI is a difficult endeavor to quit in all but a few locations, so I knew just starting was a big commitment. Leaving McGrath was an even bigger commitment, and I struggled a lot to do this, even though I was healthy and having a great time. 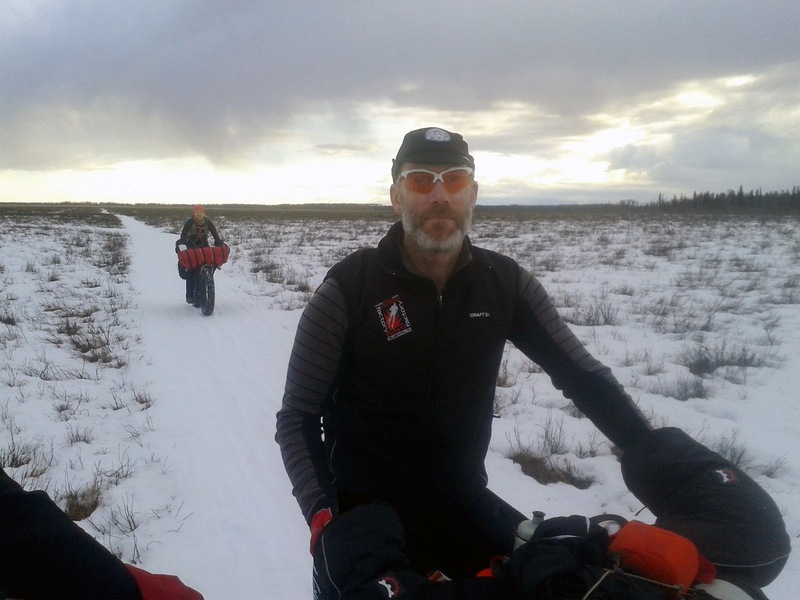 Just as I learned a lot from the negative aspects of my Tour Divide experience, I relearned many great lessons from the overwhelmingly positive aspects of my ITI experience. Jill, I enjoyed these last two posts. You come from such a different perspective than the other competitors out there. It's refreshing. 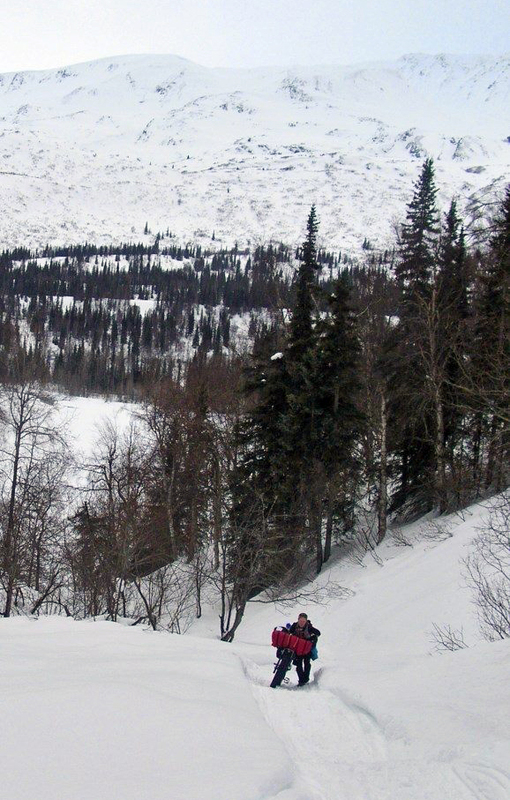 It's almost as if you are giving us a true behind the scenes look at the Alaskan wild. An honest portrayal of all the ups and downs. However, the best thing about these posts is the smile on your face. I can even see you smile behind your face mask. It's as if you're saying, "I'm in my element and there's nothing else I'd rather be doing in this moment". Priceless. First of all, big congrats to you and Beat! Too bad you hurt your arm - I was hoping for some bike rides in April. But you need to make sure it is healed of course. How about a trail run? I have never figured e.g. Beat's favorite route from Skyline to Portola Redwoods. I can offer a cool loop at Morgan Territory with views of green hills! As long as it's not more than 15 miles and you guys don't mind waiting for me (often). Great post. I look forward to them immensely. It makes me keep dreaming of possibilities of what one can accomplish if you don't give up and keep trying. It's an amazing world that you have gotten to experience. Just love the pics. Although I have been following your adventures since the PCT, I continue to be stunned by your endurance and the vast beauty of where your adventures take you. I was so relieved for you that your body made it through! Fantastic effort by you Beat and all the others. Really great to hear about the people involved and the people along the way. Camaraderie and hospitality are some of the best feelings in the world.